Daryl Powell struck a defiant mood despite seeing Castleford Tigers suffer their third defeat in four games when they lost a thrilling derby at Leeds Rhinos. 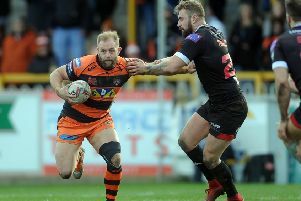 The Castleford Tigers head coach was pleased with the courage shown by his players in coming back strongly at the Rhinos after being 20-4 down into the second half and reflected on the team's first experience of golden point Super League, which saw the Rhinos edge to a 21-20 victory. He said: “It’s not a great way to lose a game. They are tough to take. “I thought we deserved something out of the game, particularly the second half. We were outstanding and clearly the better team in the second 40 minutes, but we were poor in the first half. Powell had praise for some of the players in his team and struck a defiant mood. He said:”I thought Calum Turner did really well, Peter Mata’utia played well on the right hand side in the second half and our pack was superb in the second half. We just marched Leeds consistently, but against the run of play that was a big try to concede when we kick into the legs and they run the full length. Castleford missed chances to win the game late on before it went to extra-time, particularly in the final seconds when Paul McShane chose to unsuccessfully run the ball on the last tackle with Jake Trueman in good position to land what would have been a winning drop-goal. Powell explained: "Macca came to me afterwards and said 'I should've given him the ball there', but the game's quick and there's a lot happening. "It should have gone to Truey definitely, but I actually thought there wasn't much wrong with that first drop-goal when Truey nailed it and I think the player just ran into Liam Watts (referee gave a penalty against the Tigers) so I think that was a poor call. "But I've no issues with the loss. It was a tight game. They edged the first half and we smashed the second half, but such is life. "There was a great atmosphere and it felt like they'd won a cup, it was that excitable. I know Leeds have been doing it tough and Dave Furner just said to me 'who'd be a coach? It feels like that at times." Powell admitted there was work to be done by his players to improve. He added: "I'm proud of the players and a lot of the things they did, but the first half we were pretty poor and some of the individual performances within that were unacceptable. "There's work to be done. Injuries are not getting any easier and we'll just have to battle our way through it. "There's clearly a few boys who are not quite good enough at the moment, but I don't have any options. We're picking the 19 we've got generally every week." Castleford lost Chris Clarkson to a hamstring injury in the game while Jordan Rankin missed the match with a hamstring injury with Powell expecting him to be out for three or four weeks.